The Manky is a cool new fabric forest map or …map on a hanky! Made of micro-fibre the Manky is durable, legible when wet, can be washed and dried, is absorbent, anti-bacterial, eco-friendly and totally re-usable. And you don’t need an origami degree to fold it. It can be stuffed in your bag or pocket or tied around your bike’s handle bars. And at the end of its life as a map you can use it to clean your sunnies! The Manky is just right for those who want something easy to carry and who need a convenient navigation tool. It’s got the whole forest on one side and an enlargement of the core tracks on the other. Regular retail price is $22.50. All the information you need about purchasing a map can be found on the Map & Recreation page. 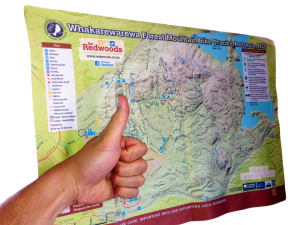 Remember riding in the forest is free so by purchasing a map you are supporting maintenance of the tracks and facilities in the forest, including a grant to the Rotorua Trails Trust for seasonal maintenance. If you’d like to purchase a map to plan your trip to the forest please click here.